We are attorneys who give you straightforward advice and pragmatic solutions to your legal problems. Are you going through a divorce or a difficult child custody battle? Have you been charged with a felony? Are you looking to recover damages for a personal injury? Whether you need legal representation for your family law, criminal defense, or personal injury matter, we can help. 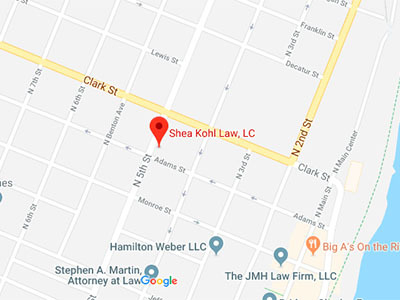 Since 1984, Shea Kohl Law, LC has been providing high-quality, personalized legal services to residents throughout Missouri’s St. Charles, Lincoln, St. Louis, and Warren counties. Clients from areas such as Columbia, Hannibal, and Cape Girardeau also look to us for assistance, as do residents of Illinois. When you want solid facts and a candid appraisal of your case, along with practical working solutions to your legal problems, turn to us. We don’t sugar coat or make false promises to you. We tell it how it is. That saves you time and money.